Purchase lingerie at a discount up to -60% off ! Choose from a selection of our brands of underwear, nightwear and swimwear at a reduced price in this sales category. OUTLET > Manufacturer MassanaThere are 21 products. 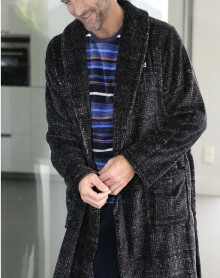 The dressing gown Massana black is very comfortable. His classic black polka dot is embellished with small ears on top, which gives it a touch of originality. Composition: 100% Polyester. 2 Boxers Massana UP27337. 90% coton 10% Elasthanne. 2 Boxers Massana UP27338. 90% coton 10% Elasthanne. The Massana Pajamas is an original rose. Beach dress Massana sponge material.